Back in the fall of 1995, we noticed an interesting letter to the editor in the Arizona Republic. It was from a man named Rick Ross who complained that the Republic‘s story about a lawsuit (which had gone against Ross) had failed to include the most important things about it — namely, that the newspaper had left out all mention of the Church of Scientology’s role in it. We’d read a little about Scientology and were intrigued by it. And the newspaper we worked for at the time, the Phoenix New Times, encouraged us to find stories that the local dailies had ignored or had done badly. We reached out to Rick, and it led to our first cover story for the paper. It also put us on a path of developing sources about Scientology, a path we’ve been on for 19 years now. Ross at that time lived in Phoenix. He moved to New Jersey several years ago, and we’ve stayed in touch all this time. We even both showed up in a (kind of weird) History Channel 2 “America’s Book of Secrets” episode on Scientology this year. 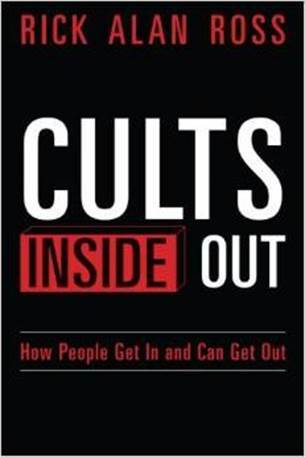 In October, Rick’s book, Cults Inside Out: How People Get In and Can Get Out, hit Amazon, but he’s been unable to do any publicity about it until this week. We were fortunate enough to get to read it before publication, and we learned even more about the kind of work Rick does, helping families convince loved ones to leave destructive groups. He specializes in Bible-based groups, but he’s also worked with Scientologists, as well as people who got involved in groups that don’t call themselves churches. The book goes into detail about methods that Ross uses to penetrate the indoctrination that members of Scientology and other groups experience. And along the way, we get a glimpse of the twists and turns his career has taken over the past 30 years. Tony Ortega is currently executive editor of The Raw Story.Previously, he had been the editor-in-chief of the Broward-Palm Beach New Times from 2005 to 2007 and the editor-in-chief of The Village Voice from 2007 to 2012. After leaving the Voice in September 2012, Ortega began writing a freelance blog entitled The Underground Bunker (Tonyortega.org) that is focused solely on Scientology.The blog’s webmaster is Scott Pilutik, a lawyer who also works as a legal expert for Ortega.